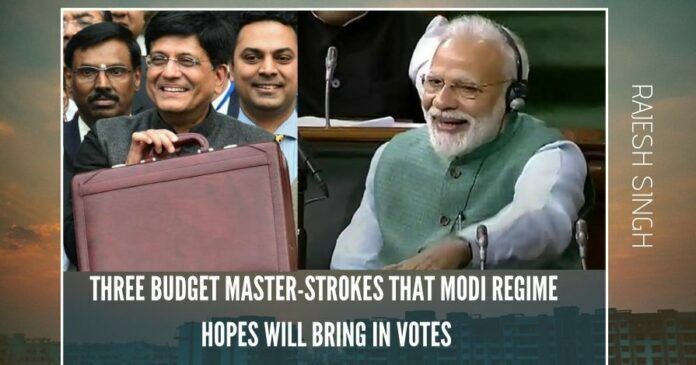 The budget presented on Friday by Piyush Goyal turned has energized the BJP-led NDA Govt ahead of the elections and left the Opposition fuming. ‘Interim’ Union Budgets are generally drab affairs since they are restricted to providing money to run the country for a couple of months or so before a new regime takes over and presents a full-fledged account. But the one presented on Friday by Finance Minister Piyush Goyal turned out different. It has energized the Bharatiya Janta Party-led NDA Government ahead of the big election and left the Opposition fuming. Tax collections have steadily gone up over the last four years, inflation is under control, fiscal deficit has been contained, and the current account deficit too, is at a healthy level. There is enough elbow room for the Government even as it remains fiscally prudent. The first criticism from the other end is that it is an ‘election Budget’. Every fifth Union Budget is generally an election budget, so there is nothing that the opposition parties need to take exception to, in the interim Budget of 2019-20. The second criticism is that it is all about pronouncements (jumla). Again, every Budget document is a set of proposals, and it is only after the announcements are endorsed by Parliament that the implementation begins. The third criticism is that the Modi Government, in electoral haste to sound populist, has made promises that would be hard to keep. That would be known in the months to come, and prejudgements are not in order. That said, the interim Budget has rattled the opposition parties because it has reached out to the farming community, the middle class, the salaried section and the unorganised sector — all of which had staunchly backed the Modi-led BJP in 2014 but had over the last couple of years drifted away from the party for variety of reasons. If the Budget proposals can sway this large part of the population towards the BJP, the opposition parties will find their dream of dislodging the regime shattered. Leave aside the enhancements in allocation to the Pradhan Mantri Grameen Sadak Yojana (Rs 19,000 crore) and the Mahatma Gandhi National Rural Employment Guarantee Scheme (Rs 60,000 crore) — the hikes were expected. The big announcements lie in the following: One, the structured income support to farmers having up to two hectares of land; two, a mega pension scheme for workers in the unorganized sector; and three, a full rebate for individual taxpayers having an income of up to five lakh rupees annually. They can be the game-changers for the Government in election season because taken together they cover a vast majority of the voting public. The structured income support scheme, which has been named the PM Kisan Samman Nidhi, proposes to offer small farm-holders an assured sum of Rs 6,000 per year. This would be over and above the various other benefits that they presently derive in areas of agriculture, health, and other social services. Unlike farm loan waivers, which are a one-time affair, the PM Kisan scheme gives an income year after year — over the next five years. The amount will go directly into the beneficiary’s bank account in three equal installments of Rs 2,000 each. At least 12 crore farmer families will benefit from the new proposal. The masterstroke is the Finance Minister’s announcement that the scheme would be effective retrospectively from December 2018 once Parliament gives its approval. The Opposition has ridiculed the announcement on the ground that Rs 6,000 per year is a tiny sum and an insult to the distressed farmers. It must be kept in mind that the PM Kisan fund is not an ‘income’ but ‘income support’ which is expected to complement the regular income of the farmers. But the real reason for the disgruntlement, especially of the Congress, is that it has taken the wind out of the sails of Congress president Rahul Gandhi’s announcement a couple of days ago that, if his Government came to power, it would launch a universal basic income scheme. The mega pension scheme is also a revolutionary step. Workers in the unorganized sector have generally been left to fend for themselves and have not had access to various safety nets that govern the organized industry. Now, those who subscribe to the pension plan — paying a small amount beginning from Rs 55 per month — can get a monthly pension of Rs 3,000 once they reach the retirement age of 60 years. The Budget has allotted Rs 500 crore for the pension fund. At least 10 crore workers in the unorganized sector can benefit from the Budget proposal, a figure that should give sleepless nights to the opposition parties. The third is the startling decision to bring out the individual taxpayer earning up to five lakh rupees per annum, from the tax slab. In fact, if one takes into account various deductions that an individual taxpayer can avail, an income of even over Rs 6.50 lakh per annum would attract zero tax. This is a windfall for the individual taxpayer, and at least three crore tax-payers would be direct beneficiaries of the Government’s magnanimity, and the Modi regime would be certainly hoping that a large number of them would back the NDA in the coming election. There is, of course, the issue of finding the money for these generosities. Those details would be known in the months to come. But the Government is sitting pretty on the revenue front. Tax collections have steadily gone up over the last four years, inflation is under control, fiscal deficit has been contained, and the current account deficit too, is at a healthy level. There is enough elbow room for the Government even as it remains fiscally prudent. Three Budget master-strokes that Modi regime hopes will bring in votes, Had it been presented LAST YEAR, things would have lead towards semi Rama Rajya by now, if not full Rama Rajya and made election roads this year clear towards two thirds majority on its own by the BJP. How far BJP karyakartaas take these benefits up to the grass root levels remains to be seen. Better late than never.Well done. Modi Government has tactfully sealed this WASTEFUL DRAIN 1 Triilion annually – through judicious employment of AADHAR – which is now diverted to VARIOUS GENEROSITIES.